The availability of historic data on the sales volume of Wi-Fi and CD-Recordable makes it possible to estimate the effect of patent royalty payments on the adoption of standards. Royalty payments increase the cost of products. And higher costs lead to higher prices for consumers and higher prices can reduce product sales volume. 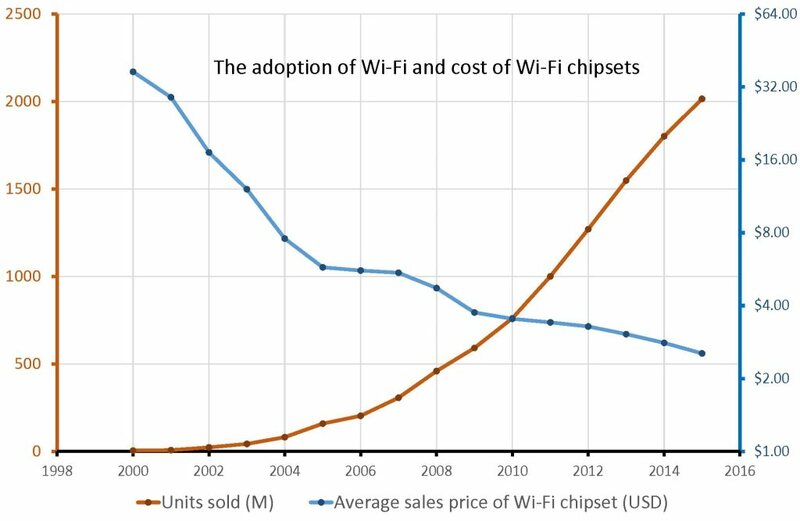 The adoption of standards such as Wi-Fi and CD-Recordable, is also sensitive to cost. Higher costs can be expected to have a negative impact on the use of standards. How strong is that effect really? 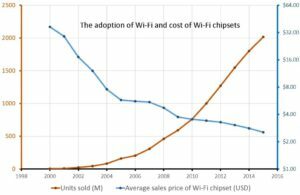 In an analysis published on IPWatchdog.com, I estimate that a royalty rate of 10% of the chipset cost would have delayed the adoption of Wi-Fi by 3-6 months in the early stages of Wi-Fi adoption. When a standard is mature, and widely used, the effect of royalty collection is much smaller. The market data on CD-R illustrate that royalty payments of 40% of the manufacturing cost had no impact on sales volume. Previous Previous post: Assigning value to individual essential patents – what is the RAND royalty rate for a single essential patent? Next Next post: Can patent owners block the use of a standard?